“Cavities” is a scary word – it seems like your worst nightmare come to life when your dentist discovers a cavity. This irreversible tooth decay is one of the most common ailments in children and has affected 91 percent of Americans over the age of 20. Cavities are a form of tooth decay that eventually create a hole in the tooth. They are created when leftover food particles react with oral bacteria to create an acid, which gradually attack tooth enamel. Cavities are so common because it’s easy for food particles to get stuck in the mouth’s many hard-to-reach places, allowing the slow decay to go unnoticed. Cavities can’t be treated yourself and are best avoided with thorough prevention, so it’s important to learn about dental health and develop a healthy dental routine. The mouth contains over 700 different bacterial species, some act as protectors of teeth and gums, some help digest food, and others are harmless. Only a few of these bacterias are linked to the formation of cavities. Streptococcus mutans is the most common bacteria that is harmful when it gathers in your mouth. When enough food particles build up, the streptococcus mutans bacteria creates an acid which eats away your enamel, leaving the tooth unprotected against decay. Despite popular belief, sugar is not the main cause of cavities, though it definitely assists in the building of bacteria and acid. Consuming any starchy food – including cookies, cake, chips, bread, crackers, pasta, soda, fruit juice, and citrus fruit – can eventually lead to cavities. These foods are full of refined carbohydrates, white flour, or sugar that easily stick to the surface of the teeth, initiating the production of acid. You can prevent decay by limiting your intake of these foods and brushing after eating them. According to the American Dental Hygienists Association, about 78 percent of American children will have at least one cavity by the age of 17. This number is alarmingly high, and fuels the common belief that younger ages are more susceptible to cavities. This is not the case as cavities can form at any age, leaving adults to fear cavities just as much as. Children have higher cavity rates as they have yet to understand the importance of routine brushing and flossing, and prefer foods high in sugar and starch. Perhaps the scariest characteristic of cavities is their irreversibility. 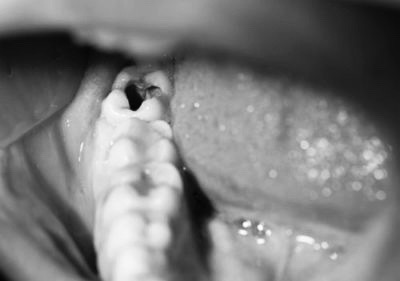 When a cavity forms on your tooth, it will first start to decay the enamel, then create a hole in the tooth, which continues to grow as bacteria hides in the hole and is impossible to brush out. Once the decay is present, its damage is permanent and is only fixable with a dentist’s visit. Your dentist can reverse the damage by extracting the infection and using a filling to seal the hole in your tooth. How do you stop cavities? Prevention is the best strategy for keeping cavities at bay. Using toothpaste and drinking water both containing fluoride is an effective way to prevent decay. But the most effective strategy is regular brushing and flossing to get rid of any food particles left in the mouth. Flossing may seem unimportant, but it allows you to reach hidden spaces a toothbrush can’t reach. Those tight, hidden spaces account for 40 percent of your teeth’s surface area, giving food particles and bacteria plenty of places to hide. The American Dental Association conducted a survey in 2014 which made some surprising discoveries. It reported only 40 percent of Americans floss at least once a day and only 20 percent never floss, while only two percent of Americans rarely brush their teeth. Cavities aren’t common because Americans forget to brush their teeth, but because we don’t floss. Flossing is the missing piece of the dental routine essential in preventing cavities. As cavities start to form, the decay will cause the infected area to turn a different color. Early signs of cavities appear as white spots on the enamel and will gradually turn dark brown, passing through various shades of light brown as the decay progresses. If left unchecked, the cavity will eventually create a hole in the tooth. It is difficult to detect a cavity on your own as you can’t always feel early decay. Decay begins in the bone of your tooth and if left unchecked, will eventually form a hole which makes its way to the nerves in the center of your tooth. By the time you can feel a cavity, the decay has reached the nerves and has already caused extensive damage. Prolonging trips to the dentist’s office may allow new decay to create even more damage as cavities are difficult to detect on your own. As a cavity continues to grow, it can eventually lead to a painful jawbone infection, or dental abscess. Early signs of jawbone infection include pain, sensitivity, bad taste in the mouth, fever, difficulty opening the mouth, difficulty swallowing, gum inflammation, or pus drainage. Schedule your routine dentist appointment to catch tooth decay before it progresses into a damaging cavity. For more information about cavity prevention, symptoms, or repair, contact Idaho Falls Smiles online or call us at (208) 524-1700. This entry was posted in Cavities, General on August 14, 2018 by Barton.